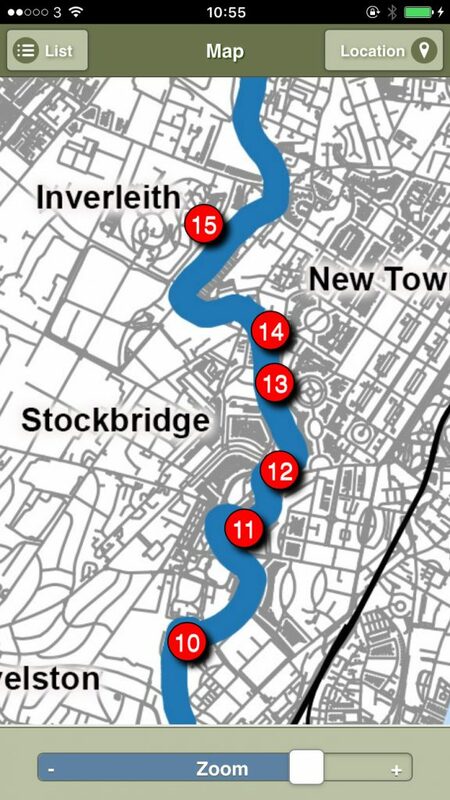 This week the Water of Leith Walkway Audio Tour app went live in the Apple iOS app store and the Google Play store. We have produced this in partnership with our friends at the Water of Leith Conservation trust. The walkway was established in 2002 and runs from Balerno all the way to Leith passing near to the foot of our garden in Inverleith. The most popular section of the walkway is between the botanics and the Scottish National Gallery of Modern Art. The trust created an audio tour of the route several years ago but it was only available on-line. You needed a data connection on your phone to listen to the tour. You only discovered the points as you got to them. The new app uses the same technology as our Dawyck Scottish Trees app. There are twenty audio points to listen to, a sketch map and a GPS positioning system to show where you are along the route. It was relatively little work to accommodate the larger scale of the walkway map. Importantly from the point of view of the botanics a series of bug fixes and improvements were incorporated into the core code and a new version of Dawyck Scottish Trees app released. These improvements will also roll forward into the planned Inverleith audio tour next year. Each time we produce one of these audio tour the quality goes up and the work involved goes down. This is a soft launch at a quiet time of year to check everything is working and get some feedback. We will advertise it more widely in the spring. If you would like to try it out just search for “Water of Leith” in the app store on your device. Please let us know how you get on and if you like the app rate it in the store.